At the end of last year I was working with Stream Media on several projects, but perhaps one of the most enjoyable was the promo/contest video I was hired to make (along with the Stream team) for the Medicine Hat College. What was particularly memorable about this project (which was completed in mid-January) was that I was actively involved from start to finish. Often I work strictly in post-production these days, but this time around I was asked to be part of the pre-production creative process and was able to see a lot of my ideas carried out. In looking back at this assignment it's clear to see what a great group experience I had with Stream and how by borrowing on each of our strengths we managed to come up with something that we were all quite proud of. I've been no stranger to working with the College over the last several years that I've been at Stream, and have had my hand in everything from MHC's athletics promotion to their recruitment videos - both as an editor and videographer. Of the edits that I've helped produce, the College pieces are by far some of the most varied and fun assignments that I've done for any single client. As part of the Medicine Hat College's 'Face of MHC' campaign, in which students have a chance at winning free tuition among other rewards, the focus has been to find a student to document their experiences while showcasing all the different things going on at the College. It's exactly the kind of contest/opportunity that I would've been all over - had I been going to school there that is. To be a part of the brainstorming process to come up with a promo idea is always fun because you get to see the evolution of rough ideas and concepts. Even when it's difficult, it's amazing to see how a video takes shape just by throwing ideas around. You throw something in the pot, take something out, add a dash there, and purge a lot of leftovers - it's a good way to bond. Of the few times that I've done this, especially now that it's with people I know quite well, it can be energizing to see how others can take your ideas and turn them into something you may not have thought of (and vice versa). Originally, the idea for this project was to create a single edit. During our initial creative meeting I actually pushed the idea to create a short series of spots to establish more of a vignette of the college and the students who go there - both Stream and the College were keen on the idea and as added motivation for myself, I got to see my vision of the project being fulfilled with the creative contributions of everyone else involved. I was not part of the shooting, but with Stream working closely with the College, some great candid footage of actual MHC students was captured. The real challenge was that each of these spots had to be exactly 30 seconds, which is a tight timeline to really establish anyone. Ultimately, it provided me another great opportunity to further test my editing style. The work that the Stream team put into shooting these spots translated into the job I was able to do editing. It can be incredibly challenging trying to get real people to show some personality on camera, but in all 3 videos I think things went better than expected. In short, the project came together fairly seamlessly and in the end both MHC and us were really pleased. These promos are simple and to the point, and for their intended purpose I think they feel both genuine and playful. I'm really pleased with what we were all able to come up with. 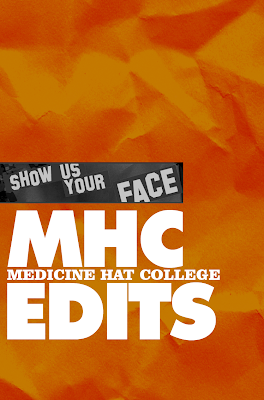 The actual contest page for the Face of MHC can be seen on the Medicine Hat College's website here. In the meantime, check out the 3 promos I cut last month.